Movements: A change in the position of any object is called movement. Many movements take place in our body and also in other organisms’ body. Locomotion: When movement results in change of position of the whole organism, it is called locomotion. Movement of teeth and jaw. Movement of arms and legs. Movement of some organs happens because of the teamwork of bones and muscles. In such cases, movement is possible along a point where two or more bones meet. The location where two or more bones meet is called a joint. Ligaments bind a bone to another bone. Tendons bind a bone to a muscle. Fixed joints: The joints where no movement of bones is possible are called fixed joint. The joints in the skull bone (cranium) are examples of fixed or immovable joints. Ball and socket joint: In this joint the rounded end of one bone fits into the cavity (hollow space) of another bone. It permits movement in all directions. The joints between shoulder and the upper arm is an example of ball and socket joint. Similarly, the joint between thigh and hip is an example of ball and socket joint. Pivot Joint: This type of joint allows movements in many planes, viz. up and down, side to side movements. The joint between the skull and the vertebral column is an example of pivot joint. Hinge joint: This joint is similar to the hinges in a door. This joint allows movement only in one plane and only up to 1800. The knee joint and elbow joint are examples of hinge joint. Gliding joints: The movement in this joint happens due to sliding of bones over one another. Joints between the rings of the backbone are examples of gliding joint. The wrist joint is also an example of gliding joint. The framework of bones and cartilage which gives shape and support to the body an animal is called skeleton. The human skeleton is made up of 206 bones. While the bones are hard, cartilages are soft. Cartilage is found between joints and in some elastic organs; like ear lobe and nose. Cartilage reduces friction between a joint. Chest bone or Rib Cage: It forms a cone- shaped bony cage. The bones of the cage are called ribs. There are 12 pairs of the ribs. They attached to the vertebral column. The rib-cage protects the lungs and the heart. Backbone or Vertebral Column: The vertebral column extends from the base of the skull to the hip. It consists of 33 small rings; called vertebrae which are joined from end-to-end. Shoulder bone or Pectoral Girdle: The shoulder bone is formed by the collar bone and the shoulder blade. It is attached to the upper part of the rib-cage and to the upper arm bone. Hip Bone or Pelvic Girdle: It is formed by the fusion of three bones, the hip bones and the tail parts of the backbone; to from a large bony bowl. The thigh bones are attached to the hip bone. Skull: The skull is at the top of the vertebral column. It is composed of two main parts. Cranium: The cranium gives protection to the brain. The bones of the cranium are flat and are held firmly in a Zipper- like manner. The joints of the cranial bones are fused joints. Facial bones: These bones make the front and the lower part of the skull. The lower jaw bone or mandible is the only movable bone; which helps us to chew, eat and talk. Earthworm: Earthworm has a segmented body. It has a large number of very small bristles on the ventral surface of the body. The surface which is close to the base is called ventral surface. These bristles are connected with muscles at their bases. 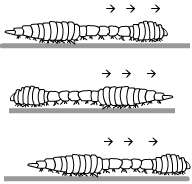 The earthworm moves by contracting and expanding alternate portions of its body. When the anterior or front part of the body contracts, the earthworm holds the ground with its bristles; and drags the posterior potion of its body forward. After that, it contracts the posterior portion and holds the ground with bristles. Now, the anterior portion of the body expands and moves forward. Snail: The snail has muscular foot which helps in locomotion. The muscular foot is made up of strong muscles. Cockroach: A cockroach has three pairs of jointed legs, which help it to walk, run and climb. It also has two pairs of wings; for flying. Large and strong muscles help in the movement of legs. Birds: birds can walk on the ground and fly as well. Some birds can also swim in the water. A bird has streamlined body. Its bones are light and strong. They are hollow and have air spaces between them. The hind limbs of birds are modified as claws, which help it to walk and to perch. Birds have special flight muscles and the forelimbs are modified as wings. The wings and tail have long feathers, which help in flying. Snake: The body of snake consists of a large number of vertebrae. The adjoining vertebrae, ribs and skin are interconnected with slender body muscles. When the snake moves, it makes many loops on its sides. The forward push of the loops against the surface makes the snake move forward. Movement of snake is called slithering movement. Fish: Fish swims with the help of fins. They have two paired fins and an unpaired fin. The body of a fish is streamlined to reduce friction; while moving in water. They have strong muscles, which help in swimming. When a fish swims; its front part curves to one side and the tail part stays in the opposite direction. In the next move, the front part curves to the opposite side and the tail part also changes its position to another side. The tail fin helps in changing direction.